Moms do a lot for us. They really deserve more than just one day out of the year. Mother’s Day give us an opportunity to tell the mom’s in our lives just how much we appreciate, respect and admire her. What better way to show the mom in your life how much you love her than to take the time to make her a Mother’s Day brunch? Not much of a cook? Don’t worry! We have provided an easy but delicious chocolate waffle recipe and as a bonus some tips to remove chocolate stains that may occur while enjoying your homemade Mother’s Day brunch. If the mom in your life has a sweet tooth, like most women, she will love this chocolate waffle recipe. Here is a recipe for a Mother’s Day brunch that is sure to satisfy her sweet tooth. In a medium bowl, mix together flour, sugar, baking powder, and salt. Sift the mixture to remove any clumps then set aside. Place the butter and chocolate chips into a pot and melt at a low-medium heat on your stove top. Stir continuously so the mixture does not burn until complete melted. Or you can place the chocolate chips and butter in a microwave-safe bowl. Cook on high power for 1 minute, then stir. Continue to cook for 15 seconds at a time, stirring each time until chocolate is melted and smooth. Set aside to cool. Once the chocolate mixture is fairly cool, stir in the milk, egg whites, and vanilla. Pour this into the dry ingredients, and mix just until completely blended. Preheat the waffle iron and coat with cooking spray. Spoon waffle mix onto the hot iron. Be sure not to overfill so that the batter drips out the side. Close iron and cook until the iron stops steaming, and waffles are easy to remove. Repeat with remaining batter until you have the desired amount. Serve with strawberries, raspberries, whip cream, maple syrups, chocolate sauce or whatever you want to top them with and enjoy! If while enjoying your Mother’s Day brunch chocolate waffles and the unthinkable happens and chocolate ends up on your carpet, don’t panic. Accidents do happen, especially when kids are involved, but truthfully spills happen to everyone no matter your age. We have provided some tips to remove chocolate stains from carpet. Chocolate is a tricky stain to remove from carpet. It is a “combination stain” because there are several stain-causing ingredients within chocolate. This makes it that much harder to treat. Carefully remove as much of the solid portion of the spill as you can. You can use a dull butter knife to scrape the excess (if it is a hard chocolate) then blot with a paper towel. Be careful not to rub. Rubbing will force the stain further into the carpet fibers. After blotting as much as you can of the stain neutralize it. Mix a solution an ammonia solution. 1 tablespoon ammonia and ¾ cup of water. Fill a spray bottle with the ammonia solution. Saturate the stain but make sure not to soak the backing of the carpet. Blot with a plain white paper towel or cloth to remove excess moisture. Printed or colored paper towel or cloth may bleed onto the carpet. If the stain still hasn’t been lifted mix up a solution 1-quart water and ½ teaspoon dish soap. Continue applying and blotting until the stain is complete gone. When the stain is gone rinse with clear water and blot. It is important to rinse thoroughly. Dish soap left behind on the carpet will create residue and attack dirt. Chem-Dry of Auburn/Lincoln technicians have been trained the proper techniques to remove the most difficult stains. This includes chocolate. We use the finest green cleaning products and innovative equipment to tackle all kinds of stains. 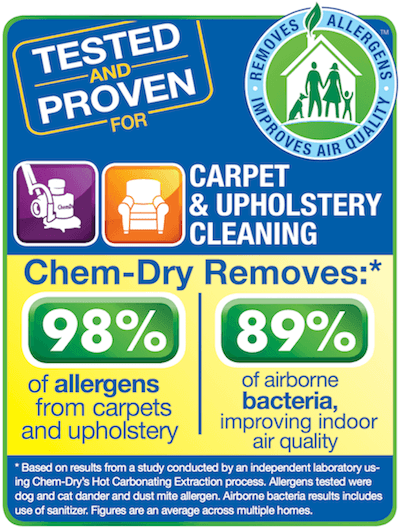 Chem-Dry of Auburn/Lincoln provides the drier, cleaner, and healthier carpet cleaning for your home. 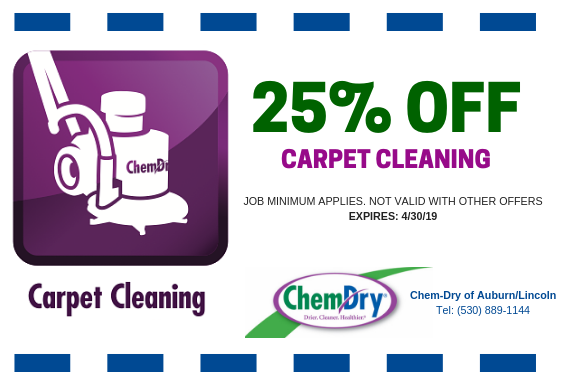 The longer a stain sits on your carpet the harder it is to remove. So if the techniques above did not fully remove the stain do not delay in calling (530) 889-1144. 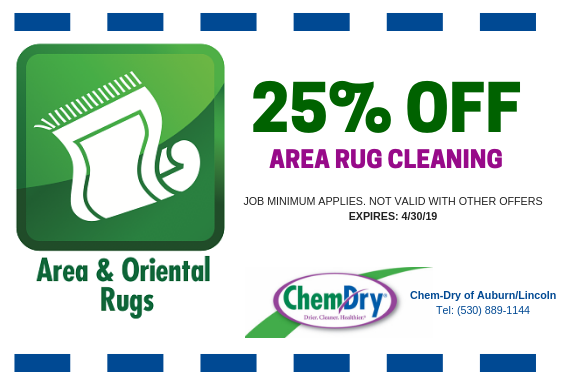 Chem-Dry of Auburn/Lincoln is able to fight the toughest stains. 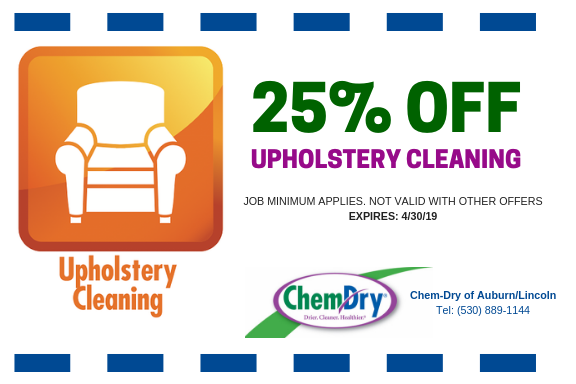 Our upholstery cleaning service is able to remove the most difficult stains like chocolate from your furniture as well.